I wanted to do a post about eyebrows after seeing Carlos' post on his blog. If you haven't read it, you might as well do it now, since I'm not covering the same material here. 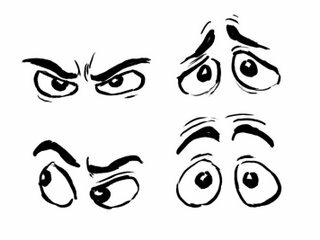 Eyebrows are one of the most important parts of facial animation. 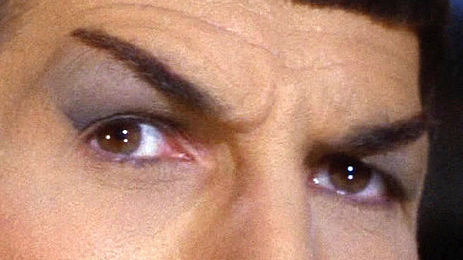 Sure, the eyes are the "windows to the soul", but the brows are, like, the window dressing. Okay, that's a crappy stretch of the metaphor. Eyebrows are hugely expressive, though, and can go a long way towards communicating your character's thoughts and emotions. They are capable of bigger shape changes than the eyes alone, and often read better from a distance. Brows also change the shape of the eye; make the shape of your character's upper lids echo the shape of the brows so they feel connected and fleshy. 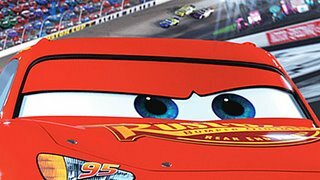 If your character doesn't have brows (such as the characters in Cars) then you must use the upper lids to mimic the behavior of brows. 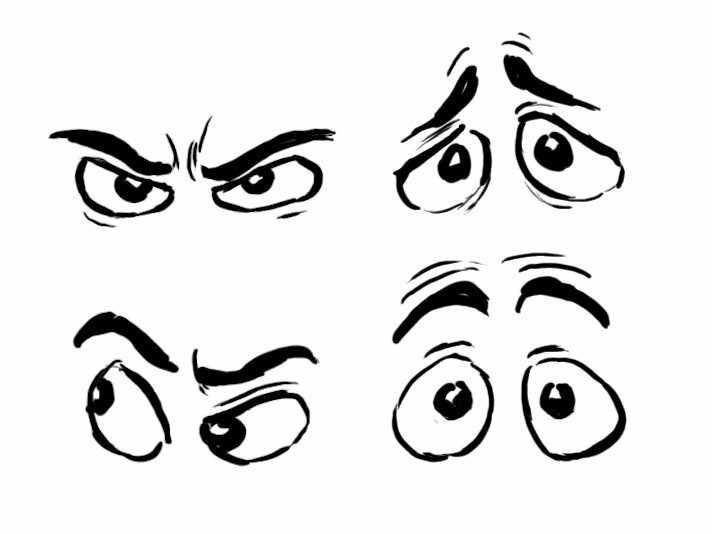 Animation tip: have your brow animation precede any head or body movement. Otherwise the brow action will be lost in the movement and the audience will miss it. This technique also helps to make the character look like he's thinking before he's acting. Below are some stills from a scene in Ratatouille (animated by Michal Makarewicz), in which the deposed chef Skinner tastes the titular dish. Skinner is largely hidden behind the table and his sunglasses, so his brows end up doing much of the acting. You can clearly see the sequence of his emotions in his brow: angry determination, surprise, ecstasy, and back to anger. Spontaneous facial expressions (surprise, fear, pain, etc.) 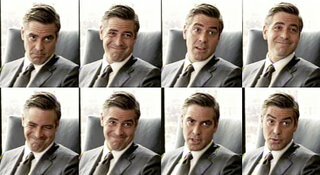 tend to be symmetrical, where as expressions we choose to make (curiosity, suspicion, contempt, etc.) can be more asymmetrical. These are just trends, not rules, but they're a good starting point and they work well. Try them! I hope you have enjoyed browsing this article. VERY informative stuff, thanks for sharing this! I love seeing this kind of thing. Seeing your examples really help too! Most informative! The material discussed -- including that of the details covered in Mr. Baena's blog and in the books you mentioned -- is beneficial to both the professional and amateur artist alike. Thank you very much for sharing this with us! Thanks for the post, Victor. Great stuff! 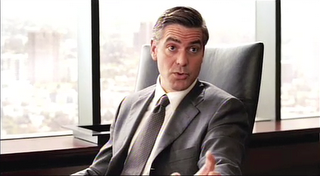 The most interesting part of the Clooney clip for me is about 3/4 through the scene when he leans forward and says "Nothing?" He's barely moving, his eyes are wide open, and his brows don't move up on the accent at all. When he breaks his gaze and finally looks down, there are some eye darts and a minor brow squeeze. 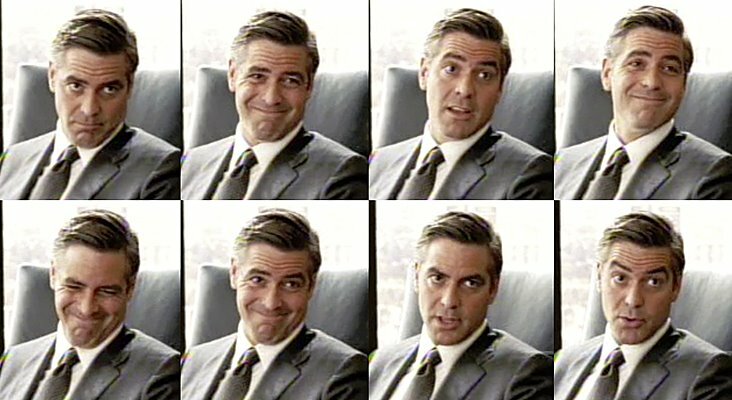 He moves his brows up and down a bunch for the first part of the scene, when the banter is humorous. Once it turns serious he moves less and his performance becomes more intense. I just really like that restraint. If I had to animate that shot, I would be tempted to push the brows up with the voice on "Nothing?"... I find it difficult to strike a balance between doing enough and not doing too much. this is very useful doc, thanks victor! Great post Victor. I'll make sure to add a link of this post on my site as well as it's very useful stuff. I really think this ties greatly on facial expressions. At one point all parts within the face should work together, and eyebrows are no exception. Additionally,in case it helps, while it starts to touch on advanced stuff, I wrote this small post a while back, that I'm planning on elaborate more on in case it's of help to people. Wow, thanks Victor! This is incredibly informative and helpful. I'm working on a new shot and I plan to try this stuff out for sure! I'm in the preproduction of my senior thesis and my main character is a grim reaper - without a lower mandible or eyeballs, so the majority of animation has to come from his brows and your post really helped! thanks. thank you so much Victor, great reading, bookmarking riiigght now. Thanks a lot for this post victor really nice and strong idea, to help us.